The first Griffith University aikido dojo was formed in 1981 by Michael Williams Sensei and was the first Ki no Kenkyukai (Ki Society) Aikido dojo in Australia. What is now Griffith Aikido Institute Inc was officially established and recognised by the university as the ‘Griffith University Aikido Club’ around this time. It was visited by the then Chief Instructor Maruyama Sensei in 1985. Training was initially conducted in the Hub building at Griffith University. During this time the tatami was shared with a number of table tennis tables. Apparently ukemi often involved the dodging of flying ping-pong balls. Before moving to its current location at the Nathan gym the dojo was located in University House. Here we were treated to sticky floors as it was often used as the student kasbar at other times, prior to this location. In 1989 this dojo was passed to Stoopman Sensei with Williams Sensei relocating to Byron Bay to build the Australian headquarters dojo – Goshinkan dojo. In 2001 the club began operating its own dojo(s) run by staff and students of the university and other club members. Around this time the club was supporting three styles of aikido. The club dojos rose from the humble beginning of a few academics and students practicing ‘kumijo’ on the ovals and rooftops at lunchtime. Word slowly spread and a club dojo was formalised. Following the return of Master Koretoshi Maruyama in 2002 (after 10yrs of seclusion in a temple) the club was pleased to affiliate with Aikido Yuishinkai. We introduced specialist weapons training as a part of his syllabus. In 2003 we were delighted to open dojos at the Southbank and Logan campuses of Griffith University as well. The club was well known for having many yudansha (black belt members), often outnumbering the kyu grades in the mornings. 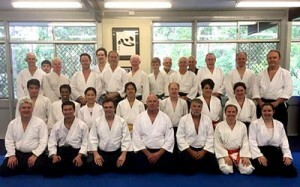 Many Australian aikido dojos promoting a number of styles (Ki Society, Ki Aikido and Aikido Yuishinkai) are now run by instructors who began their training our Griffith University Aikido Club. In April 2007 we became registered as a not for profit organisation as “The Griffith Aikido Institute Inc.” with the Queensland Office of Fair Trading.